Interesting! So this week’s theme is similiar to last week. The dog card points to friendships, partnerships, or someone we know and trust. I feel that we will be dealing with someone in particular. Someone who has been in our lives for quite some time (Anchor) so it could be a a long term relationship, a best friend, relative or a boyfriend/girlfriend. The book points to secrets and the unknown and with the anchor card, it seems that someone important in our lives has been withholding something for a long time and we are not aware of this. ( Dont worry people! I didnt get anything on cheating or some scandal so sit back down! lol) The whip usually means arguments and anger but I get the impression of someone confessing whatever they been withholding in a dramatic matter and with the Cross, it seems to be related to something that causes them pain or sadness. 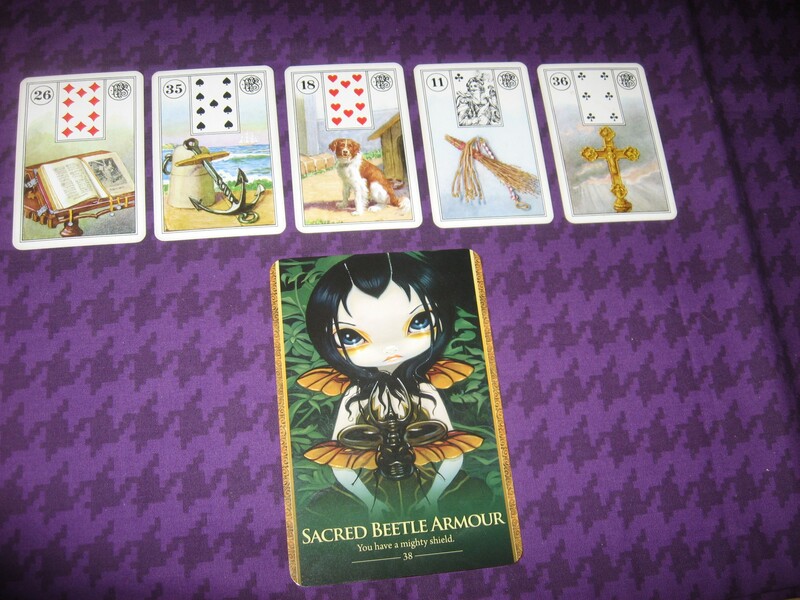 The oracle card “Sacred Beetle Armour” confirms pretty much everything I said as some of the meanings for this card points to being guarded and protecting yourself from pain. So I guess this week won’t be all happy-go-lucky but the best we can do is be supportive and show empathy to anyone that decides to share their “secret” pain to us as its probably not going to be an easy thing for them to do especially since the anchor card shows its been withheld for so long. Have a safe Halloween guys! « This darn headache that won’t go away!